An earthquake of magnitude 7.1 reduced by USGS to a mag 6.8 struck 135 km (85 miles) east of the town of Rabaul, on the eastern tip of Papua New Guinea’s island of New Britain, at 3.39 a.m. on Friday, local time (1739 GMT on Thursday), the U.S. Geological Survey said. The shallow quake was not expected to cause a tsunami. 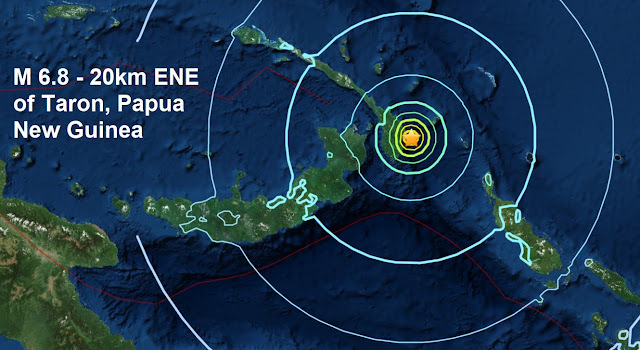 This evening's tremor was the 5th major quake to strike Papua New Guinea in the last two weeks. A very powerful magnitude 7.5 quake rocked Papua New Guinea in February killing more than 100 people and destroying villages. Terrified locals in the Southern Highlands, Western, Enga and Hela provinces have also had to deal with more than 150 strong aftershocks, including four 6.+ magnitude tremors since the mag 7.5. "Around 143,000 people are affected and 17,000 people have been generally displaced because their homes are either fully or partially damaged and not in a condition to live in." Today's major quake is the 26th major quake of 2018 and the 3rd one of March. Of the 26 major quakes reported this year, 25 of them have occurred during coronal activity on the sun.